Finding our feet | Damian Trasler's Secret Blog - Do Not Read! I keep trying to remember previous moves. God knows, there have been enough of them, so why can’t I remember how long it normally takes us to get settled in? Yes, it could be said that this was an unusual move. For one thing there was a sudden last minute delay, which scrambled things a bit, and we’d only just come back from holiday etc etc. But it’s been nearly a fortnight in the new house now, and I’m itching to be shot of the detritus of moving. I want all the boxes gone, I want the temporary piles of stuff sorted and put away. I want to be MOVED IN now, thank you. Mrs Dim doesn’t quite agree. Right now we’re living a stripped-down version of our old life, with a lot of our everyday clutter still boxed up and in the basement. With no internal staircase, it’s all going to stay in the basement for a while, because retrieving it is a nause neither of us is interested in. The weasels haven’t noticed that they haven’t got more than ten percent of their toys available, and if we’re all getting by, then there’s the hope that instead of unpacking all those boxes, we can just shuffle them off to Yard Sales or charity shops…. We also have visitors on board at the moment. My brother and his wife have come out with their three boys, and despite Steve’s visit last September, they feel like our first official visitors. Is that because they’re family? Perhaps. They’ve rented a nice house on North Shore because we couldn’t quite put them up here (and let’s face it, if you’re on holiday, why not holiday in a nice house of your own, rather than camping out with relatives?). So, in between box opening, hanging pictures and fixing furniture, we’ve been doing the tourist stuff all over again, rediscovering why we love this area so much. Last night we went out dinner and were gently questioned about our reasons for emigration. I went off on my usual rant about not running away from the UK so much as running towards better opportunity, better prospects for the weasels and house prices, and Mrs Dim cut across and said “Don’t be stupid! It was just because we were bored and hadn’t been anywhere exciting…” Folks, don’t make life-changing decisions just because you’re bored, that’s today’s advice. And men, never assume you know the answer to a question when your wife is in the room. It was a lovely evening, but we came away having realised that we’ve been tremendously self-absorbed. That may be because of the emigration. Certainly we contracted to our family unit when we first arrived, since we knew no one and had only phone and e-mail to stay in touch with other family and friends. In the year that’s past we’ve expanded our circle of friends, but I wonder if all the people we speak to in the UK think we’re monomaniacs, out to convert them to the cult of Canada? We just wanted to reassure everyone that we were happy here, that it wasn’t a grim struggle for survival against the weather, the polar bars and the notion of driving on the right. Now that has given way to a genuine pride in the place that we live, a love of the life we have here. Next time you call, Skype, or mail us, feel free to tell us to shut the hell up and listen for five minutes….. 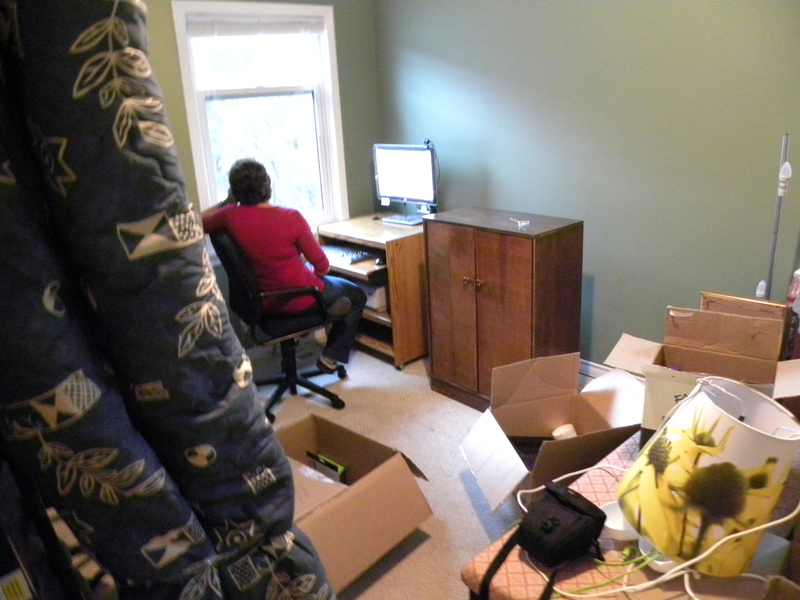 This entry was posted in Uncategorized and tagged bored, boxes, Canada, charity shops, emigration, holiday, move, moving, Mrs Dim, North Shore, polar bears, removals, Skype, UK, visitors, weasels, yard sales. Bookmark the permalink. Shut the hell up and listen for five minutes, will you? Oh – I made sesame chicken last night. Thought of you. And Terry Pratchett. Hey you! I…Ooops, sorry…Listening now….